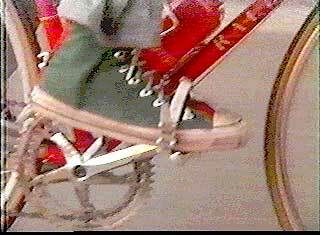 Jami Gertz and Nelson Vails wear black and pine green high top Converse “Chuck Taylor” All Stars in the film. 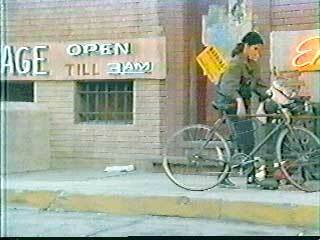 Jack helps Terri after a truck knocks her off her bicycle. Quicksilver is the story of Jack Casey (Kevin Bacon), a young San Francisco stock broker who one day gambles away his entire fortune (and that of his parents) on the exchange. Devastated by his loss, he decides to drop out of the brokerage business and become a bicycle messenger instead of trying to start over and recoup his losses. Even though Jack is something of a wunderkind on the exchange, and his boss wants him to stay on, Jack wants to get away from his responsibilities and experience life at the street level. There he meets a very different crowd from that of the Pacific Coast Stock Exchange. He meets young drifters without much of a clue about life, drug dealers and other low life hustlers, and a naive young homeless girl named Terri (Jami Gertz) who desperately wants to succeed as a bicycle messenger. Much of the film is presented in music video format, with scenes reminiscent of “Flashdance”, “Breaking Away”, or even “Bullitt” when we arrive at the inevitable chase scene toward the end. Life on the streets of San Francisco can be very tough for bicycle messengers. Much of Quicksilver focuses on the relationship that develops between Jack and Terri. Jack already has a girl friend Rand (Whitney Kershaw) when the film opens, but when she comes home and sees Jack helping Terri fix her bike, Rand becomes jealous not only of Terri but also the dramatic change from dating a wealthy stockbroker versus a free-lance bicycle messenger and moves out. Although the film could have focused on this lifestyle change and Jack’s family and friend’s reaction to it, instead the film focuses on two subplots involving Terri and also another young bicycle messenger named Hector (Paul Rodriguez). Determined to succeed as a messenger, and with no other visible means of support, Terri takes any job she is offered. Unfortunately, unsuspecting bicycle messengers are sometimes used to deliver drugs, and Terri soon runs afoul of a drug dealer named Voodoo (Larry Fishburne) and his enforcer Gypsy (Rudy Ramos) who see her as a weak patsy whom they can manipulate. The dealers’ mean treatment of Terri eventually triggers a war between the bicyclists and the dealers that occupies much of the film. Meanwhile, Hector dreams of starting his own business as a street vendor, but doesn’t have the money to purchase a food cart. Ever helpful and sympathetic, Jack becomes involved with them both, using his expertise with the world of finance to help Hector, and running interference with the drug dealers to help Terri. His intervention eventually leads to two climatic scenes, one where Jack decides to take Hector’s small stake and try a comeback at the stock exchange, and the other where he takes on Gypsy, the drug dealer’s enforcer, acting as a human decoy to protect Terri from further harm. Terri searches for a delivery address. Quicksilver is a film that has a lot of potential, but for some reason writer/director Tom Donnelly never follows through on its interesting premises. When Jack goes to tell his father that he has lost all of their money, his father sloughs it off, telling him that it is okay, and bravely urges him to go back to work and keep trying. But when Jack unexpectedly returns to his parents’ house, he finds his father weeping in despair at the dining room table. This is the most emotional scene of the entire film, but it is never followed up on. Another storyline that could have been developed more was the relationship between Jack, Terri, and Rand. But the minute Rand sees Terri, she acts as if their relationship is over, and that she has no other recourse then to move out, never to return. And all Jack and Terri were doing was fixing her bicycle. When you think about it, the whole premise of the film seems ridiculous. After all, Jack Casey is a stock market whiz, but inexplicably blows his entire fortune and his parent’s retirement in a one day gamble. That alone is bad enough, but what is his solution?-- to drop out completely and become a bicycle messenger! Even this would have more credibility if we had seen some sort of reflection or mental anguish on Jack’s part. It would have been more believable if becoming a messenger seemed like the only viable solution and a way for Jack to get back on his feet. Instead the film focuses on visual sequences with a rock soundtrack written mostly by Tony Banks of Genesis. An example of this direction is how the relationship between Jack and Rand was presented — not with dialogue but working out together in a Flashdance-like aerobics scene. The lead actors including Kevin Bacon, Jami Gertz, Rudy Ramos, and Laurence Fishburne give credible performances, while most of the other parts are mostly cameo in length. In the case of Quicksilver, you have to say that the medium is the message. 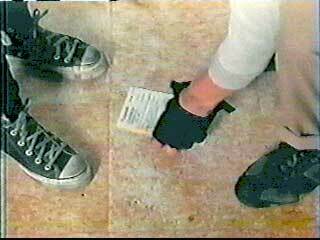 Jack picks up a delivery slip that Terri has dropped on the floor. 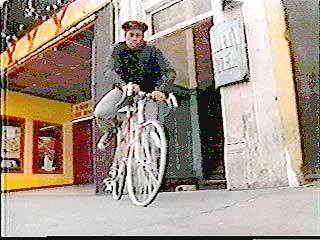 Jack challenges this bicycle messenger to a race with his taxicab. 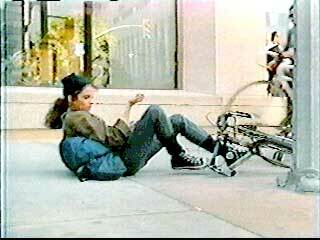 Jami Gertz is seen wearing black high top chucks in all of her scenes as a bicyclist. There are several good shots of her during Quicksilver, but the best chucks scene has to be during the opening sequence, when Jack challenges an unnamed bicycle messenger (Nelson Vails) to a race through the financial district with the taxicab he is riding in. There is some great cinemaphotography here, and we see some closeups of his pine green hightops intercut with the race scenes through the city traffic. There’s no faster way to get through the city than with chucks power. Quicksilver. (1986) Kevin Bacon, Jami Gertz, Paul Rodriguez, Rudy Ramos, Nelson Vails, Laurence Fishburne. Written and directed by Tom Donnelly. Categories: Drama, Action/Adventure.